We kicked things off in early June in Newport with a panel discussion and movie screening at IYRS. We wound our way from Newport to Block Island and the Vineyard, then down east to Penobscot Bay and back to Marblehead, Nantucket, Narragansett Bay and Long Island Sound where our friends in Greenport and Hempstead Harbor have just wrapped up the season at the Greenport Classic Yacht Regatta and the Heritage Cup, respectively. 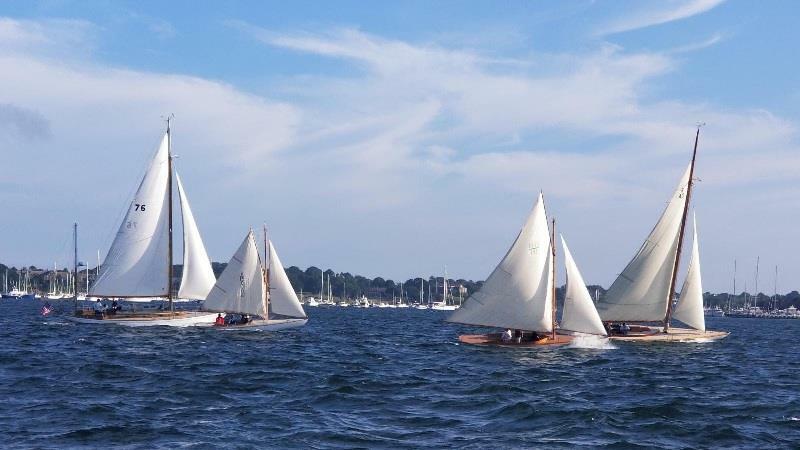 The racing has generally been terrific – and usually bracketed by some great parties in Vineyard Haven, Camden, Castine, Brooklin, Marblehead, Nantucket, Bristol, Newport and Greenwich. That’s a list of pretty nice places to visit, and all of the event organizers stand ready and willing to help with local logistics – so no excuse not to hit them all in 2019 – and we think Peter Cassidy and SIREN might have come pretty close this year! Winning is nice, but we sail classic yachts for different reasons, too, and the pictures tell that story in “living color”. Click on the links below to see some images from the events – and bookmark them so you can check them out again in the middle of the winter when you need a lift! The last weekend in July featured the Camden Classics Cup co-hosted by Camden YC and Lyman-Morse. Following right on its heels was the kickoff event in Castine on Wednesday evening. Each year, Dave Bicks and the folks at Castine YC put together a great program for this event. This year, they celebrated Maine sailboat builders with an appearance by the ever-popular Gary Jobson. 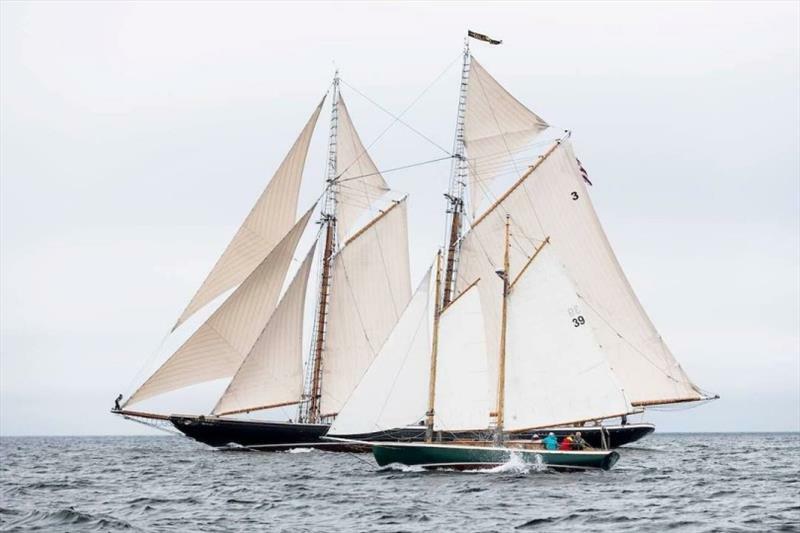 Castine to Camden on Thursday, Camden to Brooklin Friday and the “Egg” on Saturday with over 100 of the prettiest wooden boats we’ve ever seen. 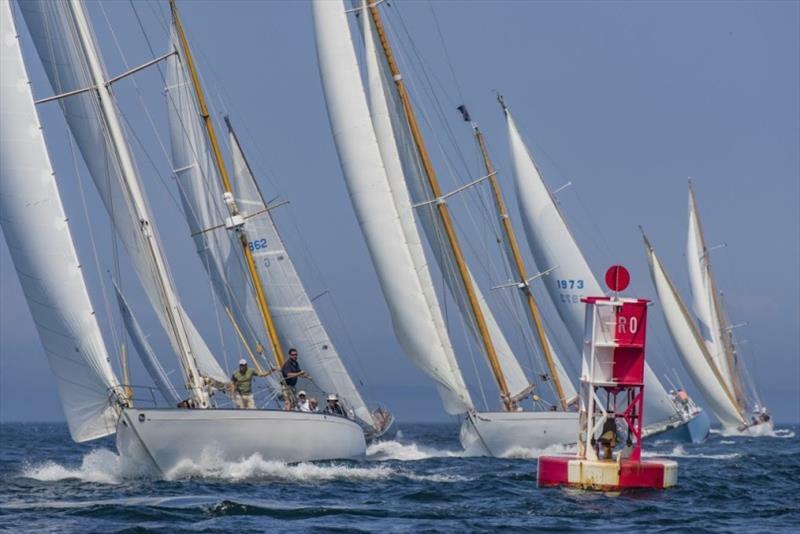 This summer, at the suggestion of GAMECOCK owner Peter McClennan, CYOA introduced four evenings of very casual classic yacht racing in Newport, RI. The races were run by Matt Duggan from Sail Newport, scores were not published (or calculated, frankly) and CYOA bought the first round at the post-race venue of choice where a prize was awarded for something other than winning. We topped out at six boats, but it was a great group and it was nice to see these fine yachts off their moorings on a weeknight. You can review the “NOR” here, and if you’re in the Newport area, we hope you’ll join us next year. If you’re not in the Newport area, start something similar in your neighborhood. If you invite us to sail, we might even buy the first round for you too! The 2018 Classic racing season is a wrap, but that just means that it is time to be thinking about how to make it even better for 2019. With regard to the ways that the 2018 version of CRF MkII worked well and less well, the best place to start is with a careful review of 2018 race results. This analysis is well under way, and the results will be shared with CYOA members soon and they will also be used to update the CRF MkII formula for 2019. Another focus for 2019 could to be in the areas of race management, regulations, class assignment, series scoring, etc. In the end, the Race Organizers will make their own choices as to how to best suit their own constituencies, but CYOA was created for just this purpose, and we plan to listen to you, the owners, and develop suggestions and initiatives that we believe can make Classic race participation easier, more enjoyable, and in the end more rewarding for owners. Watch your inbox for a more in-depth discussion of planned updates. Did you know you can keep up with all the latest results from Classic Yacht regattas and events on our website? Don’t see the results from an event? Just let us know. This year we launched a new directory on our website that makes it easier to renew your membership and update your yacht’s profile. Go to classicyachts.org/portal to log in and manage your boat’s information, upload pictures, and renew your membership. Do not hesitate to reach out with any questions!